Choosing an Office 365 plan can definitely seem intimidating. There are so many choices available to you and some implications to those choices. Microsoft offer a plan advisor wizard on their site but I am not a big fan because a new user cannot see the logic that Microsoft uses to recommend a plan. Plus it also has limited questions. I appreciate what they are trying to do though. 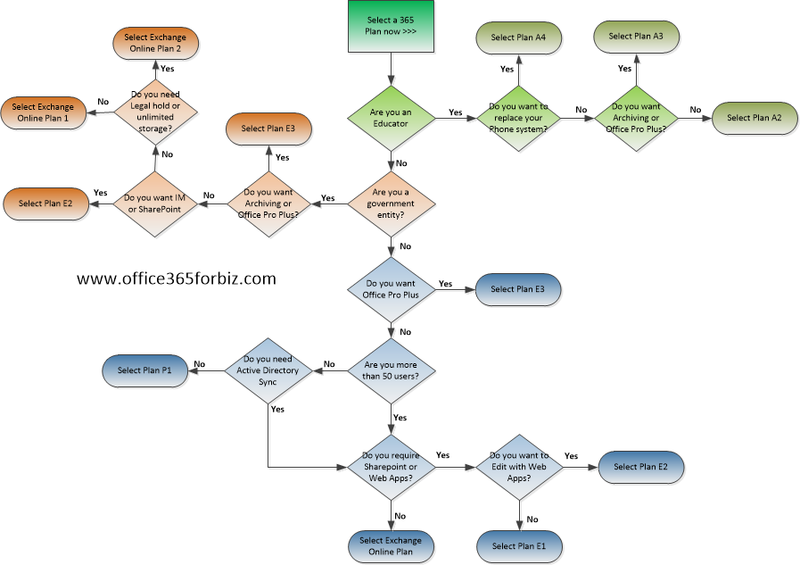 Here we can boil down your choices quite quickly and our Office 365 Plan Selector flow chart allows you to see all paths to your perfect Office 365 decision. Click on the image to the right to see it full size. If you are an in the Education sector then you will be dealing with just the green shaded boxes on the top right of the chart. Plan A2 is free of charge and provides similar functionality to the P1 Small Business Plan. For most of you this will be fine and it certainly is a great price. If you were to replace or integrate your phone system with Lync and Office 365 then you have to buy Plan A4, otherwise there is no reason to buy the plan. We recommend you don’t get this plan first off if you have zero Office 365 experience. You can always get it later and move users up to that plan when the time comes. Plan A3 which does have a small per user cost associated provides the full locally installed Office suite to your end users. 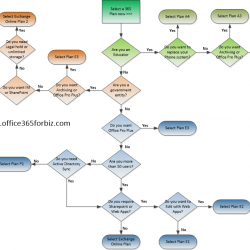 If you want Office included or must have mail archiving then this is the plan to take. The government plans are pretty much the same offerings as the Business options (without the equivalent Small Business Plan). It is worth mentioning to Microsoft that you are in the public sector because they will give you a discount over private business. If you are wanting to acquire the locally installed Office suite or must have email archiving then you need plan E3. If you dont need full Office but want Instant Messaging though Lync and SharePoint then its E2 for you. The last two plans are the basic Exchange Online plans, one plan is the standard 25GB mailbox and plan 2 offers unlimited mailbox storage and legal hold functionality. For business the decisions get a little more complex as Microsoft have two streams of products, the E stream and the P stream (for Small Business users). The first decision is whether you want to include the full local install Office suite for your users. If so you get 5 installs per user and we think that the E3 plan is fabulous value if you use it to its fullest potential – its our recommended choice. Also included are the Office Web Apps, SharePoint, Lync, and unlimited Mail Archiving. In the future this plan will be the one where you will probably see Office for the iPad added. Click here for a free no cost, no credit card trial. If you don’t need full Office the next decision is governed by if you have more or less than 50 users. If you have less then you can go for the Small Business Plan, but before you decide you need to understand whether you want Active Directory synchronization (DirSync). Read our post to understand what DirSync does. If you do require it then you must step away from the Office 365 Small Business Plan choice. If you are getting close to the 50 user level then you also might want to consider the E stream rather than the P stream as once you hit 50 you are topped out. Read 4 Things to consider when choosing an Office 365 Plan to double check your decision before selecting a stream. If you answers were No to still congratulations, you can go with the Office 365 Small Business Plan P1 (the link takes you to a free no obligation trial) which represents fabulous value at $6 per month. If you are still with us the next choice is whether you want Sharepoint or the Office Web Apps. If you don’t then you can now select the $4 Exchange Online Plan. The final decision (if you do want the Web Apps) and this is a little cheeky on Microsoft’s part is the chocie between plan E1 and E2. They are functionally the same except that E1’s Office Web Apps do not allow you to edit documents online, so you must pay $4 more per user to have that pleasure with the E2 plan. Quite a pricey jump considering Web Apps are free on SkyDrive. So just get E2 for the people that must have Office Web App edit functionality. Otherwise save the money. So that sums up the plans and the decision making process. The important thing to remember is you can mix and match within the E stream but not across the P and E streams so apart from the smallest businesses it makes sense to pay a little more and start off on the E stream. You can always have 20 users on E1 and 30 uses on E3, and 50 users on E2 all under the same company account. Then just assign licenses as the user requirements change. If you should need help or have comments please contact us directly or make them below, we await your thoughts.